Dental caries and periodontal disease are the main causes of tooth loss that should be replaced by bridges, partial or full dentures, or implants. These replacements will impact on the ability of patient to chew and swallow the food for obtaining the nutrients, and to keep the natural functions of the mouth, that include good nutrition, healthy mouth, esthetic appearance of the face and speaking clearly, for all ages. Nutritional status is the condition of health as it relates to food and nutrient intake, absorption, and utilization. It is an important factor in immunity and resistance to oral infections. Diet is essential to support nutritional status. A healthy diet contains all the necessary nutrients in amounts needed to meet individual needs. Healthy Eating Plates are recommended for persons with tooth loss and with replacements. Collaboration between dietetics practitioners and oral health care professionals is useful for oral health promotion and disease prevention and intervention. Immediate restoration of multiple defects, particularly on insufficient and aged restorations with secondary caries, is highly demanding for both clinician and material.Thanks to the matched consistency of a dental restorative material such as BRILLIANT EverGlow, anatomically correct results are easily achieved. Submicron hybrid composites shine impressively fast and consistent. Correct shading and easy polishing thanks to intelligent-design fillers which give the desired, lasting aesthetics. Permanent protection against leakage in the marginal area is a prerequisite. The high density and composition of BRILLIANT Ever- Glow composite's filler particles provide optimum shrinkage reduction, thus resulting in lower shrinkage stress. A reliable adhesive such as ONE COAT 7 UNIVERSAL used here, will help safely achieve the long-term clinical goal of sealed restoration margins. For over a decade, VITA Easyshade has stood for objective digital tooth shade determination. Since its market launch in 2004, the spectrophotometer for determining tooth shade has continued to be been further developed. Currently, the fifth generation of the digital shade determination device is available in the form of VITA Easyshade V. The developers of the Easyshade V, have long since gone beyond being focused solely on shade determination. Today, VITA Easyshade is a complete, multifunctional system that supports dentists and dental technicians with everything from tooth shade determination and communication, to reproduction and checking the shade of the finished ceramic dental restoration. Two common dentoalveolar defects are managed by a novel treatment approach. This article explains how the underlying mechanism that regulates bone physiology can be recruited to improve the response to surgical healing and presents the theoretical basis of this treatment method. Modern investigators have revealed the likely anatomic pathways through which this system operates. A specific set of rules can be defined to guide surgeons to design procedures that have the optimum potential for a successful outcome. These cases demonstrate that if this treatment method is followed, successful healing can be achieved. Bürklein, Sebastian / Schäfer, E.
Minimally invasive endodontics aims to deserve the maximum of tooth structure during root canal therapy. In the last fifteen years there has been rapid progress development in endodontics, making treatment procedures safer, more accurate, and more efficient. Meanwhile, reproducible results can be achieved even in difficult root canal morphologies with severe or double curvatures. In addition to various material improvements, the implementation of the surgical microscope in endodontics is an important innovation, making it possible to optimize each step in the treatment protocol in terms of substance preservation. The second part of this case study focuses on the inclusion of anterior crowns and CAD/CAM-based implementation of the implant- borne restoration in region 16 (IPS e.max CAD). 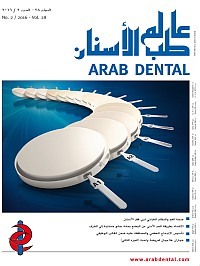 In this publication, the author awakens an interest in monolithic anterior restorations. Part one appeared in issue 1/2016.